Having seen a lot of articles recently about the ‘Best Som Tam Papaya Salad’, I thought I’d give my own take on the trend. 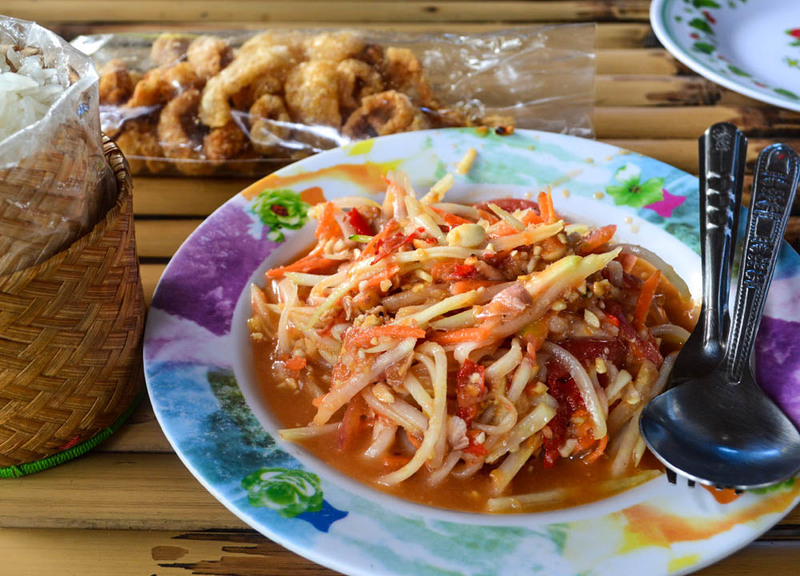 Instead of giving ‘the best’ papaya salad however, as it’s all very subjective, I will instead outline the options available to create ‘your best’ papaya salad. Each to their own and whatnot. First I’ll start by sharing my own standard som tam order which, admittedly, is less adventurous than locals. I always order Som Tam Thai, the tourist favourite, but as with all som tams, it can always be ordered to specification. For me, I order my Som Tam Thai with more hot and sour than the typical Som Tam Thai. I skimp on the dried shrimp, skip entirely on palm sugar and prefer smaller cuts of tomato and long-beans (although this isn’t so easy to communicate). Som Tam for me is all about the heat so I will normally go with 7 birds-eye chillies, which probably isn’t advisable for newbs. To add crunch I take an extra pinch or two of peanuts, and for sour, I mix both tamarind water and lime juice. My Som Tam is served less sweet (mai wan) and fiery hot (phet phet). As far as Som Tam Thai goes, this order would be closer to the local plate, but I have left out a number of the more adventurous local flavours. 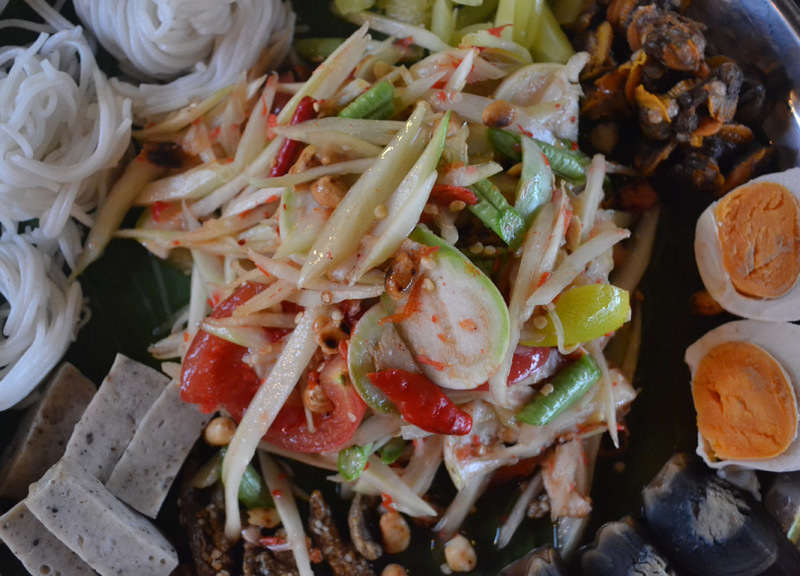 If a ‘Best Som Tam’ does exist, it will almost definitely be with Pla Ra, a pungent pickled fish sauce. If you disagree with this, and the local tastes from the som tam origins of Isaan, then they’d likely tear you apart. My personal favourite Som Tam also comes with pickled fish sauce, but, being squeamish, I now avoid it. Having seen Pla Ra made at Isaan markets, and having smelt it boiled by the local grannies here where I live in Isaan, I now find myself gagging at the thought of it. While Pla Ra can perfect som tams, it also stinks to high hell. Outside of Thailand Pla Ra is found next to none, and since it’s known to contain harmful liver flukes, it maybe best to avoid. That being said, do try it at least once. The next popular local addition is pickled soft shell crabs (poo) which for me is a no-brainer. No. Crabs are thrown in whole, and pummeled together with the rest of the ingredients. I can say that I’ve never ordered Som Tam with crab before, but I have, on occasions found stray limbs left over from previous mortar and pestle users. This isn’t uncommon with Som Tam, and more so with street food, where the mortar and pestle’s are rarely washed between each use. Be careful with allergies e.g. peanuts. The last, more palatable, local addition would be ‘Khanom Jeen’ fermented rice noodles which often added to the mix creating another popular som tam dish called Tam Sua. Note, I’ve yet to meet a local Som Tam eater who orders, or makes, Som Tam Thai, and the term is rarely known to those outside touristy areas. I don’t think I’ve once, ever, seen Som Tam served with jasmine rice. Almost always, it will come served with sticky rice, and if you’re looking for an alternative try khanom jeen, the fermented rice noodles which occasionally are an option. 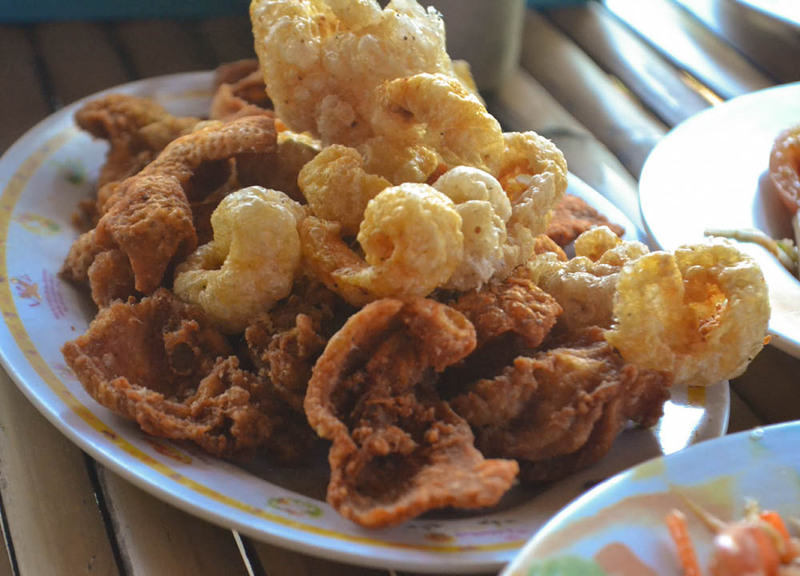 Also, most Som Tam stalls will offer small packets of ‘Kap Moo’ which are Thailand’s equivalent to pork scratchings / pork rinds. They do work well for a bit of crunch and often come side-by-side with the less common, but equally delicious Kap Kai crispy chicken skins. A bag of both work well. To make a meal of it, there will almost always be some ‘Kai Yang’ grilled chicken nearby, or maybe some ‘Kor Moo Yang’ grilled pork neck. Add a bottle of Beer Leo, some local Thai ‘Blend 285’ whisky and you can make a night of it. While I’d always stick with the above side, there is a newer fad around, one which I’ve completely failed to take to. 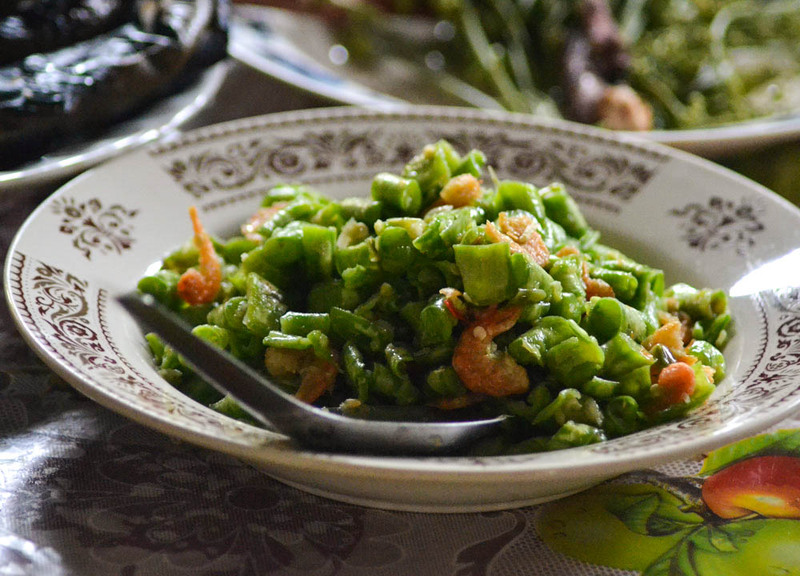 This is Som Tam Tad served on a big plate set with various local flavours and bites. There’s one pictured just below with ‘Khanom Jeen’ rice noodles, salty egg, peppered ‘moo yor’ steamed pork, dried ‘pla ching chang’ anchovies, and century eggs or ‘Khai Yiao Ma’ as they are known in Thai and this translates to ‘horse piss eggs’). Yum! 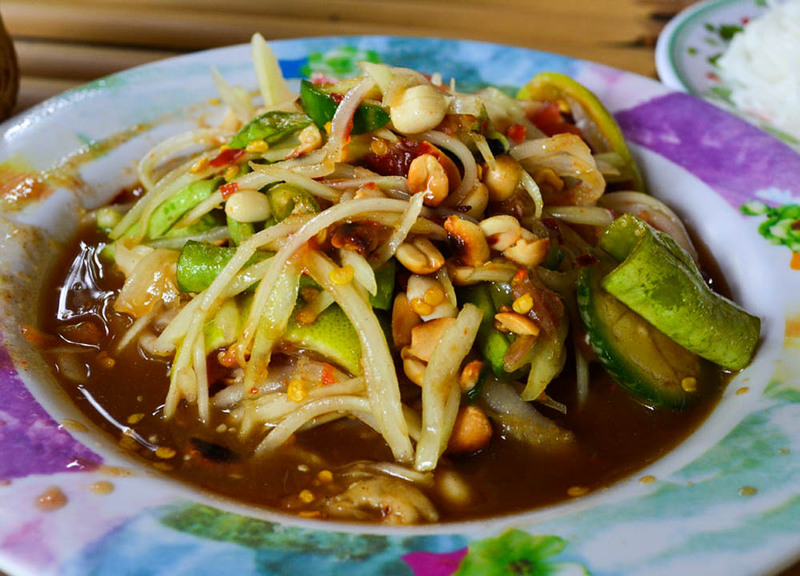 The meaning of Som Tam has nothing to do with Papaya, although Papaya is the most common version of the dish. Som Tam is more of a technique, where sour salads are pounded together in a large mortar and pestle. 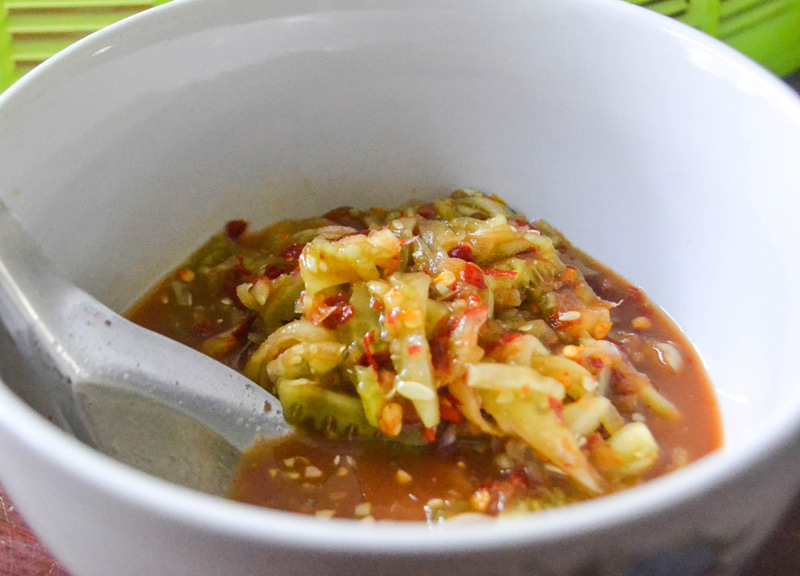 The most common ingredients will be sour / green / unripe fruits but in practice the Som Tam can be anything from fresh fruit (som tam polamai) to various veg substitutes. This often depends on which ingredients are to hand, or what’s in season and available. Obviously, outside of Thailand, there’s not great demand for unripe papaya, so they can be hard to track down. Also, shredding unripe papaya is a tricky process if not given the right tools. In these situations I’d look to easier alternatives and the simplest of substitutes would likely be the long-Bean (snake beans) in dish known as ‘Tam Tua’. Same ingredients and process, just different green. 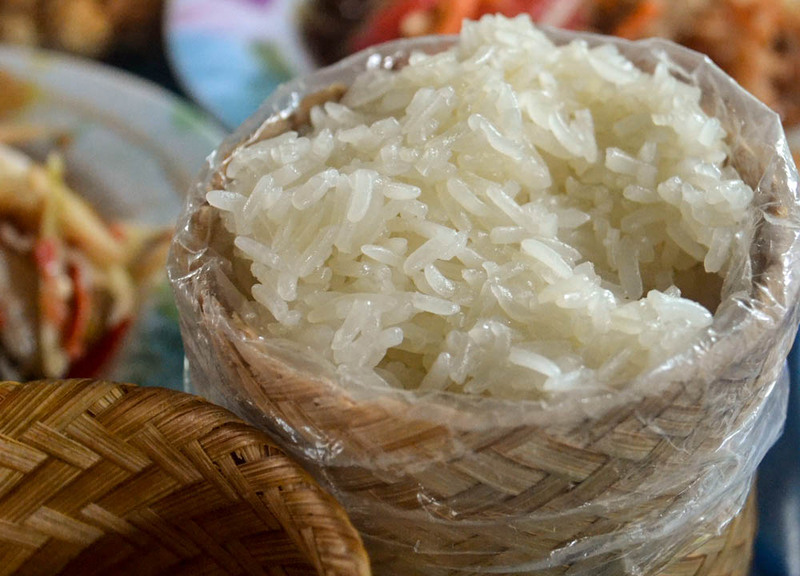 Another popular substitute would be shredded carrot which, even in Thai Som Tams, is often mixed with unripe papaya. Of course this list could go on with countless variations so I’ll just add a final, easy to find, alternative in cucumber (som tam taeng) which, after a pummeling, is often served almost like a side relish. However, given the above, I would always go back to sour and crunchy, freshly cut papaya. 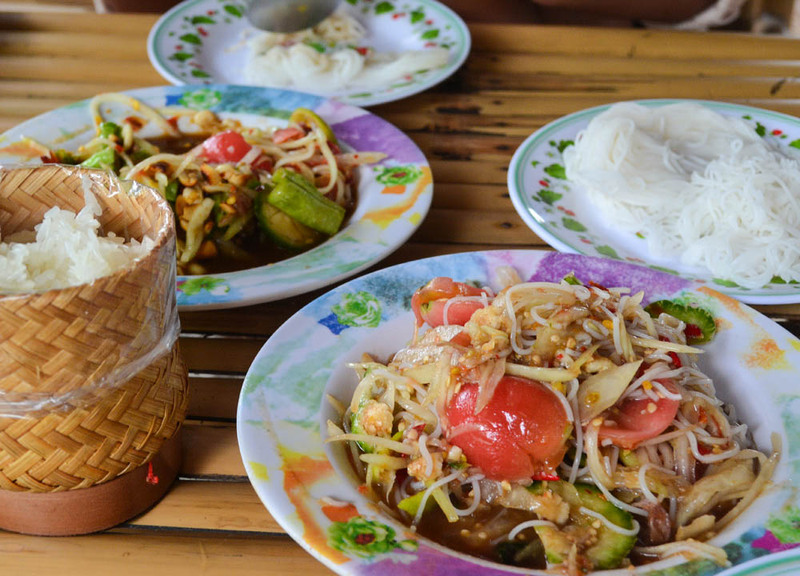 To truly understand the range of som tams it maybe best to cross borders, and while the term som tam tends to stay within these lines, the papaya salad, and variations of it, keep going. 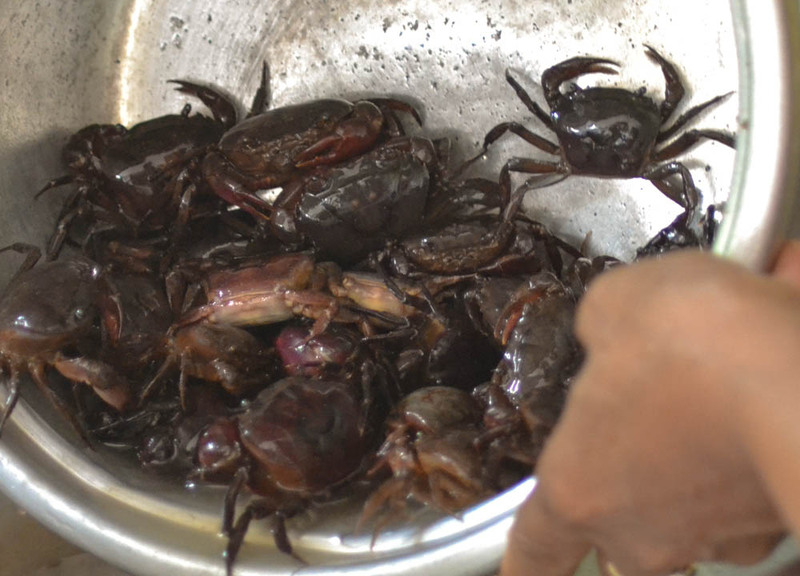 Crossing the borders from Isaan, to nearby Laos, they have Tam Mak Hoong, which is very similar to Thai Som in that it comes with pickled fish sauce (padek), and soft shell crabs, but in Laos they have their own unique twist in the addition of Makok, a sour olive shaped berry. This dish in Thailand is called Som Tam Lao. But crossing the border, on the opposite side, to Myanmar (Burma) I find papaya salads to be much more intriguing where variations are more obvious. 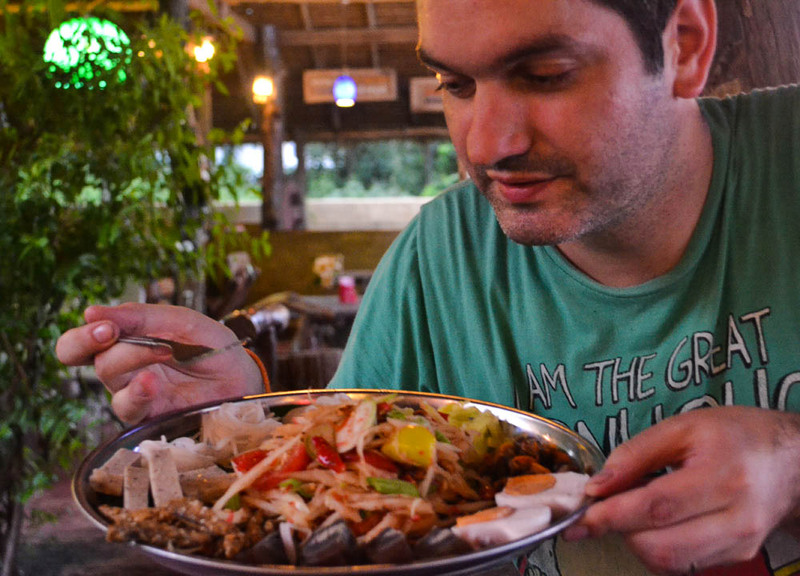 In Myanmar, the salad known as Let Thoke Sohn, translates as “hand-tossed everything” and this sums up Som Tam fairly well. The carts are full of all sorts of everything; from the basic shreds of unripe papaya, to bright and colourful arrays of native fruits. I’m sure there’s some lahphet tea leave variation along there somewhere somewhere. 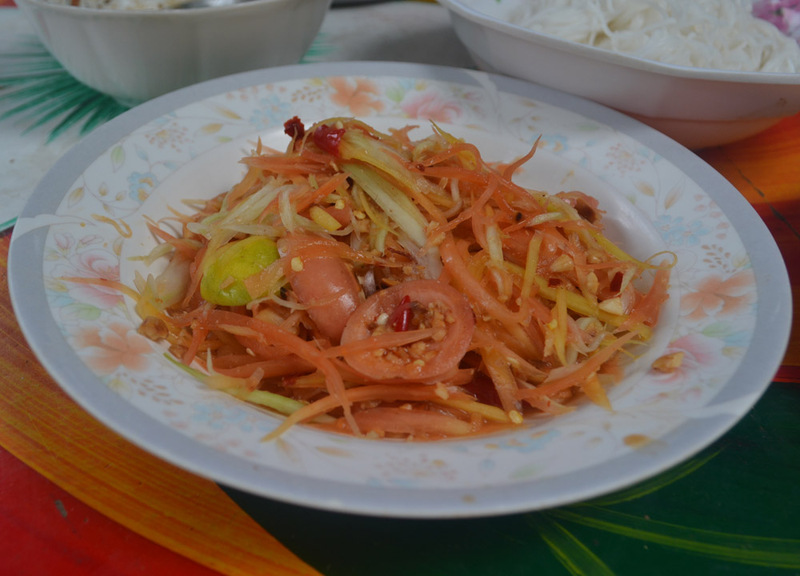 So I won’t pretend to know much about these dishes in Myanmar, because I don’t, but if you’re big into papaya salads, and want to explore some new variations, I’d definitely give Myanmar a go.